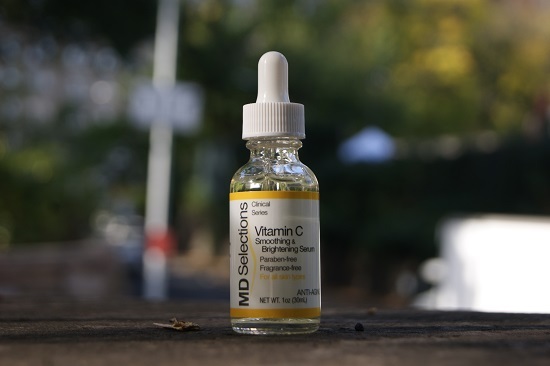 MD Selections Vitamin C Smoothing and Brightening Serum was a random find from Marshalls. It was only 8 bucks and seemed like a simple and nofrill product that I can add to my routine. The serum has a lightweight runny gel texture that gets absorbed quickly into skin, leaving skin hydrated, smooth and with no sticky residue. As you can see from the ingredient, the first few ingredients are rather non-BS proven workers. There is water, hyaluronic acid for moisture retention, glycerin (humectant), polysorbate 20 (emulsifying surfactant with a soapy water kind of texture), white mulberry extract then two forms of vitamin C (one water soluble the other oil soluble) that are both stable, supposedly. I would prefer an amber bottle but I have kept this out for a month (not exposed to direct sunlight but not in the dark either) or so and noticed no oxidation. On the face, it felt very soothing, smoothing and moistuizing. Unfortunately when I used it on my face several days in a roll, it gave me tiny red bump (what I call irritation zits). The zit went away as soon as I stopped using it...I don't waste skincare so I ended up using it on my legs. It leaves my leg so smooth during winter and I don't need to worry about it getting sticky. For 8 dollars, that's worth it already.